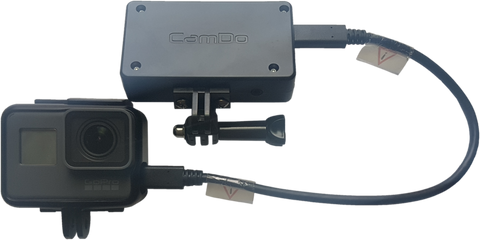 This manual describes how to get started with your CamDo UpBlink Time Lapse Controller for your GoPro HERO5 Black camera. UpBlink is a low power, WiFi enabled GoPro time lapse and scheduler accessory that unlocks the full potential of the GoPro camera. UpBlink allows users to control when and how the camera will trigger based on a daily schedule and when an internet signal is available, photos can be uploaded to our CloudX server. Configuration is handled through an easy-to-use web interface via a smartphone, tablet or laptop. Read our Quick Start Guide to get started and this more detailed User Manual for further details. You can also view helpful instructional videos in the “Support” section. 1. Power (Micro-USB connection): You can power UpBlink through the micro USB port. See Section 5. Powering UpBlink for available power configurations. 3. LED Window: This window provides LED feedback to the user during operation, as well as for firmware updates. See section LED Status Indicator for an explanation of the different LED indicators. 4. WiFi Button: This button is used to turn UpBlink's WiFi On/Off, or cancel the currently active process. 5. Strap Slot: This can be used to tether UpBlink to the GoPro or fixture. 6. Port 1 (2.5mm jack): This port accepts a Wired Remote or other custom trigger. A Wired Remote can be used to turn UpBlink's WiFi Access Point On/Off from a distance, as well as provide LED feedback during operation (if the CamDo LED wired remote is used). UpBlink also has an in-built WiFi button - see item 4 above. 7. USB-A Port: This port is used for firmware updates using a USB thumbdrive. This port’s power output also becomes activated when an upload schedule is triggered, allowing it to be used to power a 3G/4G MiFi router to provide an internet connection or power another accessory. 8. Screw Mounts: Two captive nuts (#6-32) can be used to attach the “GoPro Attachment Knuckle” to allow UpBlink to be affixed to the GoPro housing’s pivot mount. 9. Port 2 (3.5mm jack): This accessory port is currently not in use and will become available in future firmware versions. Green flashes twice: When UpBlink has been connected to a power source. Green flashes once a second: When UpBlink is booting up the WiFi Access Point for programming. Green flashes five times: When UpBlink activated the WiFi Access Point signal. Green flashes continuously every 5 seconds: Represents that the WiFi Access Point is active and the user is able to connect to the WiFi network broadcast by UpBlink for programming. Cyan flashes once a second: When UpBlink is searching for the WiFi router to connect to the internet. Red flashes five times: When UpBlink has failed to connect to the router and/or has failed to receive a connection to the internet. Cyan flashes continuously every 5 seconds: Represents that UpBlink is currently performing only the download procedure and cannot upload without an internet connection. Blue flashes five times: When UpBlink has successfully connected to the router and has an internet connection. Blue flashes continuously every 5 seconds: Represents that UpBlink has an internet connection and is currently performing the download and upload procedure. Yellow flash: Indication that UpBlink is busy. Holding the button for three seconds will end the currently active process. Yellow flashes once a second: When UpBlink is ending a process and returning to capture mode. Magenta flashes continuously every 0.25 seconds: Firmware from the USB flash drive is downloading to UpBlink. Green flashes twice: Firmware successfully downloaded. Magenta flashes continuously every 0.25 seconds: New firmware is installing. Green remains lit: Firmware successfully installed. The LED will remain lit until another function triggers the LED. Red remains lit: UpBlink has failed the firmware update procedure. The LED will remain lit until another function triggers the LED. UpBlink will not be able to read the file if the USB drive is not using the FAT32 format or the update filename has been changed. If you have ongoing issues please contact CamDo customer support. UpBlink is powered externally by via a micro USB cable plugged into the power port of UpBlink. UpBlink will then manage power to the GoPro camera via the USB-C cable. If your GoPro battery is removed, your power supply must be rated for at least 2Amps output at 5Volts. If your power supply cannot provide 2Amps, the GoPro battery can remain inside the camera to provide the additional power require by the camera and UpBlink will maintain a charge to the GoPro battery. 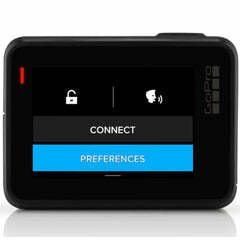 However, the use of the GoPro battery will disable the *safety reset feature. For long term installations, we highly recommend removing the internal battery of the GoPro camera to allow UpBlink to hard reset the camera to restore functionality should a camera error be experienced. *Safety Reset Feature: Removing the GoPro battery allows for UpBlink to fully manage the power supply to the GoPro camera. Therefore if the GoPro camera becomes unresponsive, such as in the event of a camera crash, UpBlink can pull all power from the GoPro to force a hard reset to restore functionality to the system (similar to pulling and replacing the GoPro battery when the camera crashes). However, if the GoPro battery remains inside the camera, when UpBlink tries to remove power from the GoPro, it will not reset the camera since the GoPro remains powered from the camera battery. 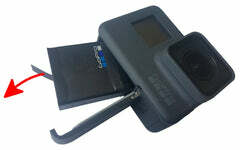 If using an external battery pack, ensure that the battery output has an "Always On" operation. It is important to note that most of the USB battery packs on the market have an automatic power saving feature which turns off the battery output if the battery pack is not constantly supplying power to a device (Auto Off feature). If the GoPro is powered off for more than a few minutes between scheduled triggers, the external battery pack might automatically shutdown due to inactivity. This automatic off power saving mode would result in the camera system becoming unpowered, while the large battery pack still has lots of capacity remaining. Our V15 and V44 battery packs are specially designed for use with the UpBlink controller as they have two modes of operation, the standard "Auto Off" mode and the required "Always On" mode. The Always On mode must be manually enabled to prevent the battery output from automatically turning off since the camera system is drawing very low power between scheduled triggers. Plug a 5Volt micro USB power source into the power port of UpBlink. UpBlink does not need to be connected to the GoPro camera to access the UpBlink App to program schedules. UpBlink does need to be connected to the GoPro camera via the included custom CamDo USB C cable for triggering the camera. Press the wifi button on the top of UpBlink (Alternatively, use a button press from a wired remote attached to port 1). If the LED illuminates green when the button is pressed, holding the button for three seconds will activate the WiFi signal. While booting up the WiFi Access Point signal the LED will flash green once a second. When the WiFi signal becomes active, the LED will flash green quickly five times before continuing to flash green once every five seconds to indicate the WiFi Access Point signal is actively broadcasting. If the LED illuminates yellow when the button is pressed, UpBlink is busy and you should either wait a few seconds to retry or continue holding the button for three seconds to end the active process. Now navigate to http://10.0.0.5:5000 with your standard web browser, such as Chrome or Safari. It’s important to include the “http://” as some web browsers require this. 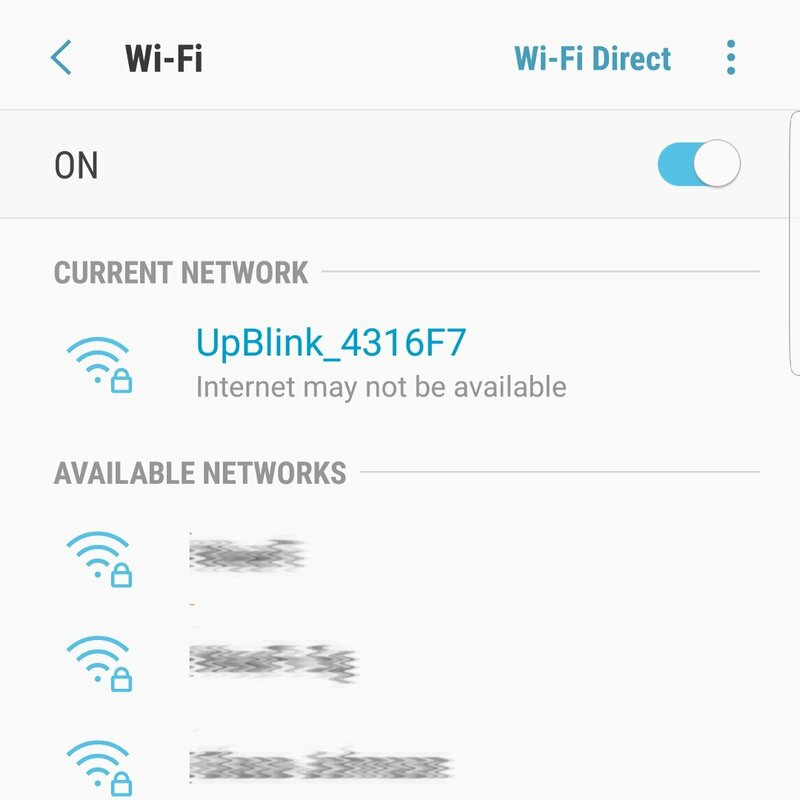 NOTE: Some phones and computers have WiFi settings that will automatically connect to a known WiFi network with the strongest internet signal rather than staying connected to UpBlink. Since connecting to UpBlink's WiFi Access Point network does not provide external internet access, some devices will not stay connected to UpBlink. You might need to temporarily adjust the WiFi settings on your device or remove any saved networks in the area for the period required to set up the new schedule of UpBlink. UpBlink’s WiFi Access Point signal can be turned on and off by holding down the wifi button on the top of UpBlink for 3 seconds. A wired remote plugged into port 1 can also be used as an alternative to the wifi button. If the LED illuminates green when the button is pressed, holding the button for three seconds will activate the WiFi signal. UpBlink flashes the LED green once a second while booting up the WiFi Access Point and then green once every 5 seconds to indicate that WiFi Access Point is actively broadcasting and can be connected to using your smartphone/computer. Once UpBlink has been programmed, the WiFi Access Point must be turned off to resume capture mode. This is done by holding the wifi button down for 3 seconds. The LED will illuminate yellow when the button is pressed, indicating that the UpBlink busy broadcasting the WiFi Access Point and continuing holding the button for three seconds to end this active process. While shutting down the WiFi Access Point signal the LED will flash yellow once a second until the WiFi signal has turned off. 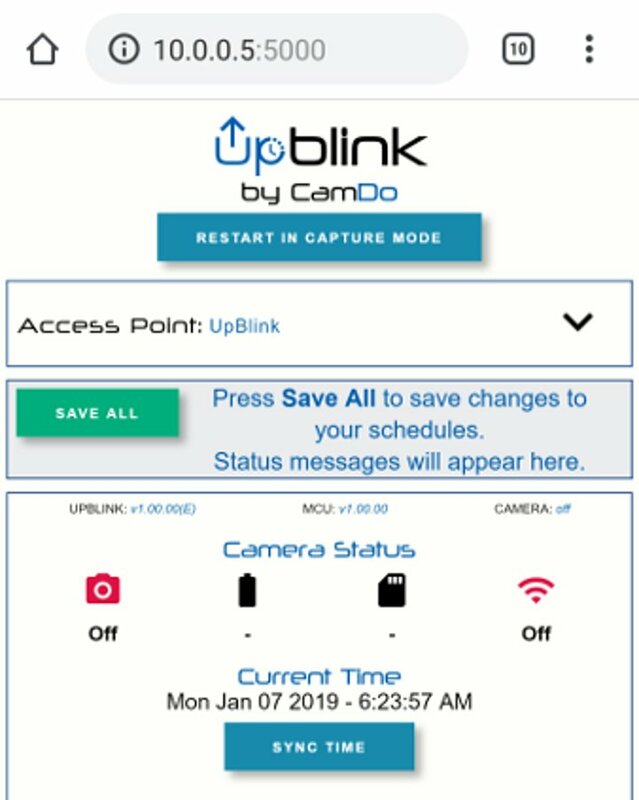 When the LED is inactive, UpBlink is now in capture mode and will trigger the camera at the programmed schedule times. To make it easy to access the UpBlink app, we recommend creating a shortcut for your smart device. After you have connected to the UpBlink WiFi signal with your iPhone / iPad, navigate to http://10.0.0.5:5000 in the Safari web browser. After you have connected to the UpBlink WiFi signal with your Android phone, navigate to http://10.0.0.5:5000 in the Chrome web browser. The following outlines the key features of the powerful UpBlink web based User Interface (UI). A. Restart Button: UpBlink's capture schedules are inactive while the WiFi Access Point is broadcasting. Clicking the RESTART IN CAPTURE MODE button will shutdown the WiFi Access Point to activate the schedules in capture mode. B. Rename Access Point : Click the Access Point drawer to open the renaming menu. 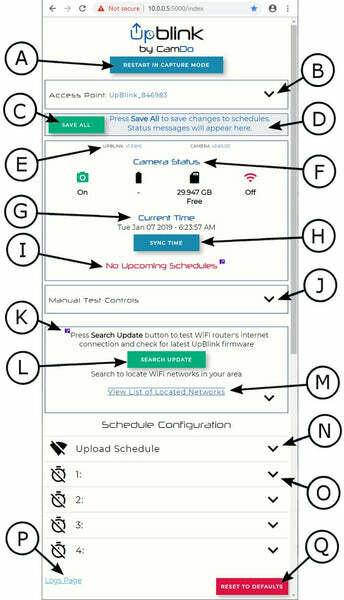 The optional text field allows you to change the appended text for the network name of UpBlink's WiFi Access Point. C. Save All: Clicking SAVE ALL will store the settings for all schedules. Important: Be sure to click "SAVE ALL" if any changes are made to the schedules. The Status message box (D) will display if there are unsaved changed to the schedules. If any schedule errors are present, the SAVE ALL button will become grey and disabled. Correct any scheduling errors to enable the green SAVE ALL button. D. Status Message: This box will display information about your programmed schedules as well as communication status between your viewing device and UpBlink. The box will display Success if your device is connected to UpBlink's WiFi and the controller has accepted the issued command. 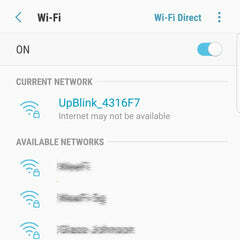 If your device is no longer connected to UpBlink's WiFi or a communication error has occurred, it will be displayed here. 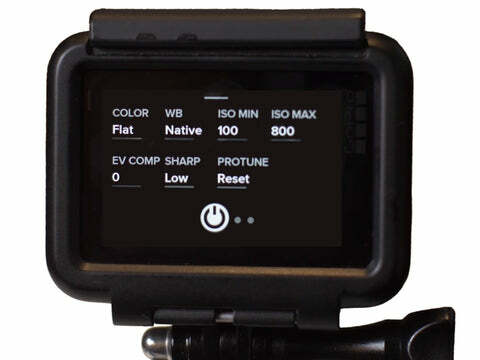 E. Firmware: Displays the current firmware version of UpBlink and the GoPro camera. F. Camera Status: Displays information about the GoPro camera including; if the GoPro is powered on, the GoPro's battery life, SD capacity available, and if the GoPro's WiFi signal is active. G. Camera Time: Displays the time and date used by UpBlink when triggering the programmed schedules. This time and date will be automatically pushed to the GoPro camera when it is triggered by UpBlink making it very easy to keep the system time up to date. If Cloud uploads are enabled, UpBlink will sync the clock with an NTP server to ensure the time always remains accurate. H. Sync Time: Clicking the Sync Time button will push the local device's time, date, and location settings to the UpBlink. I. Upcoming Schedules: Displays the time&date that the next Camera Trigger, and/or Cloud Upload are scheduled to occur. J. Manual Test Controls: This menu can be hidden/revealed by clicking on the drawer to provide a way of manually controlling the camera. These controls are typically only needed to test that the camera is communicating with the UpBlink controller. K. Upload Schedule: To upload your images to the CamDo CloudX server, click the Upload Schedule drawer to open the schedule to enter your email address, router details, and upload settings. The Upload frequency is set the same way as the capture schedules. For image upload capability, you must have a 2.4GHz WiFi router/hotspot signal within the range of UpBlink to provide the internet connection. For more information see section 9. CloudX Image Uploads. L. Capture Schedules: These numbered schedules determine when and how the camera will be controlled. Each schedule can be hidden/revealed by clicking on the drawer. 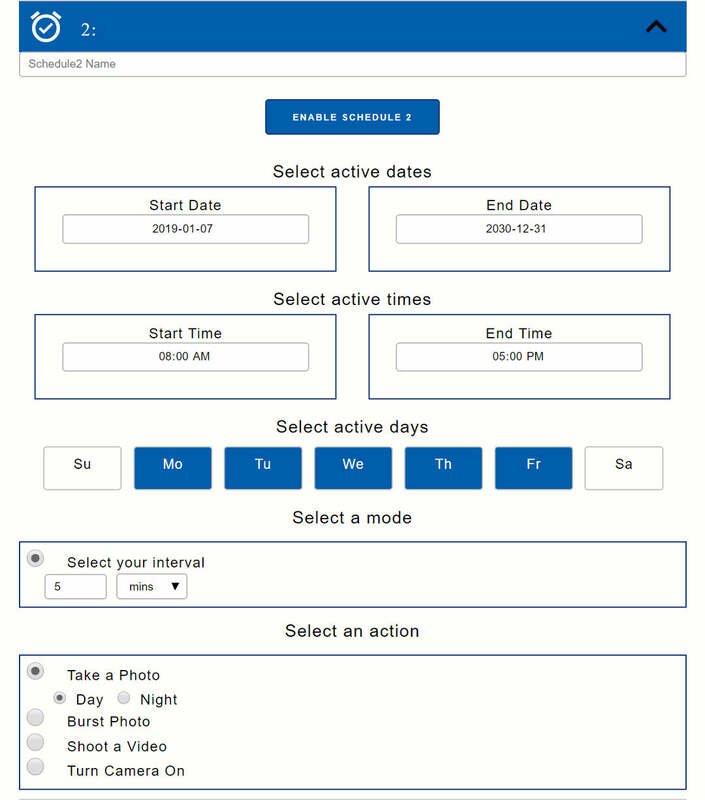 Each Schedule is comprised of a Date Window, Day Selector, Time Window, Mode, and Action. Setting these 5 elements will fully define what the camera will do and when it will do it. For more information see section 8. Setting up a Schedule. M. Logs Page: Clicking the Logs Page link will navigate your browser to the Event Log page, which can be useful for troubleshooting. N. Reset Defaults: Clicking the RESET TO DEFAULTS button will load the default schedules. The defaults will not become saved until clicking the SAVE ALL button. Refresh the page to reload the schedules that are currently saved to memory. Turn on the camera to adjust the default settings (See section 8.1 below for capture mode information). To conserve power, set the touch display brightness to the lowest 10%, the screensaver time to 1 min, and disable voice control. The LED, beep volume, and GPS can also be disabled to conserve additional power if not required. It is recommended to remove the GoPro battery from the camera after adjusting these settings to enable the safety reset feature should a camera error be experienced. Connect the camera port of UpBlink to the GoPro camera using the custom USB C cable that came with UpBlink. NOTE: UpBlink will only work with the CamDo custom USB C cable. Using any other may not trigger the camera or damage the camera or UpBlink. Connect the power port of UpBlink to a micro USB power source and wait for the LED to flash green twice, indicating UpBlink is receiving power. The USB power source should be rated for 2Amps output at 5Volts. If using our V44 battery pack, make sure to enable the Always On mode. Turn on UpBlink's WiFi signal by holding down the wifi button. If the LED illuminates green when the button is pressed, holding the button for three seconds will activate the WiFi Access Point signal used for programming UpBlink. If the LED illuminates yellow when the button is pressed, UpBlink is busy and you should either wait a few seconds to retry or continue holding the button for three seconds to end the active process. <br/ >While booting up the WiFi Access Point signal the LED will flash green once a second. When the WiFi signal becomes active, the LED will flash green quickly five times before continuing to flash green once every five seconds to indicate the WiFi Access Point signal is actively broadcasting. Open a web browser and navigate to http://10.0.0.5:5000 in the search bar. You will be presented with the following interface. Remember to create a shortcut on your homescreen as described earlier in this manual. Click the SYNC TIME button to update the UpBlink's time, date, and location settings with the local settings on your browsing device. Set the "Start Date" and "End Date" of your schedule. - In this example, the start date is set before the current date to begin the schedule immediately. Click to highlight the days of the week for the schedule to be active. - As can be seen in the example image below, Mo, Tu, We, Th, Fr are highlighted in blue, indicating they are active capture days. Set the active "Start Time" and "End Time" for the day's schedule. From the “Select a mode” menu, set the type of schedule. For "Select your interval", set the length of time between each camera trigger. The minimum interval is 60seconds. - An interval of 5 mins between images in this example. - in this example, regular Photo mode is selected. Follow the same procedure to set additional Schedules as needed. If overlapping schedules have been programmed and there is a conflict between a start time for any action, the priority is given to the lower numbered schedule. If a schedule is due to be triggered while another schedule is currently performing a task (recording/uploading) the new schedule's trigger will be skipped. Once a schedule has been modified, be sure to click the “Enable Schedule” button. A quick way to tell if a schedule is enabled is by the dark blue colour of the drop-down box. After making adjustments to the required schedules, click the SAVE ALL button pinned to the top of the UI inside the status message box. The status message box will update to display that the schedules have been saved and the camera status box will update to report when the Next Active Schedule is due to be triggered when UpBlink is reset to capture mode. If any schedule errors are present, the SAVE ALL button will become grey and disabled. Correct any scheduling errors to enable the green SAVE ALL button to save your schedules. The page will refresh and your next interval scheduled should be shown in the status bar. To begin the capture schedules, click the RESET TO CAPTURE MODE button at the top of the UI page. Alternatively, hold the WiFi button on the top of the UpBlink controller for three seconds. While UpBlink is restarting, the LED will flash yellow once per second and the LED will go dark when UpBlink has resumed capture mode. By selecting the schedule's action, UpBlink will switch the GoPro camera to the selected mode but will use the default resolutions, frame rates, and Protune settings for photo, night photo, burst photo, and video modes that have been set from the GoPro camera. Ensure to set the desired image/video settings from the GoPro camera menu before deployment. Selecting the "Shoot a Video", "Turn Camera On", & "Camera WiFi Window" actions require setting the active duration. Note that the duration selected does not include the additional time for the camera to bootup and shutdown when preforming the action. Ensure that your action's duration allows time for the camera to shutdown before the next action is scheduled to be triggered. For example, a 2minute interval for a 120second video action will only capture footage every 4minutes. This is because the camera is still preforming the current action when the next trigger is scheduled. To set a action with no end timer, set the duration to 0seconds. Scheduling a "Turn Camera On" action turns the GoPro on at the scheduled time with no further action, such as switching camera modes or triggering the shutter to capture footage. This can be used for scheduling a USB download window, or for using the camera's HDMI video output signal rather than recording to the camera's SD card. Scheduling a "Camera WiFi Window" action turns the GoPro camera's WiFi on to allow for accessing the camera via the GoPro App. The GoPro must first be paired with your device using the GoPro App before scheduling this action. For image upload capability, you must have a 2.4GHz WiFi router/hotspot signal within the range of UpBlink to provide the internet connection. When an upload schedule is active, UpBlink’s USB-A port will supply power to the connected accessory allowing this port to manage power for a "MiFi USB hotspot router". To upload your images to the CamDo CloudX server, open and enable the top schedule named “Upload Schedule” to enter your email address and router details. The upload frequency is set the same way as the capture schedules. It is important that uploads do not occur at the same start time and interval as capture triggers, since capture triggers cannot occur while uploading footage. All images captured by the GoPro will be saved to the SD card with the resolution set from GoPro camera menu. However, UpBlink provides the option to upload either the full sized image on the SD card or a smaller compressed image to reduce the upload file size. The upload mode menu provides the option to either upload all images that have been captured after a specific date, or upload only the latest image that was captured before the upload schedule was triggered. The Maximum Upload Timeout period is used to ensure the uploading of footage is stopped after a set amount of time has elapsed. 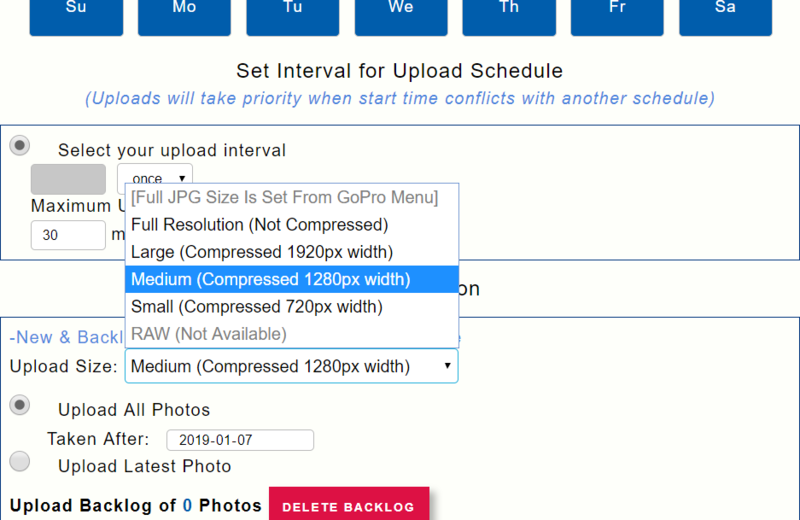 The upload timeout can be set for durations as short as two minutes for uploading images between capture intervals. The minimum upload timeout period that can be set to complete the upload of all footage will be dependant on the number of photos and router's internet speed. When the Upload Schedule is triggered, UpBlink will download photos from the camera's SD card before uploading the footage to the CloudX server. UpBlink will always attempt to download and upload at least one image per Upload Schedule trigger regardless of the timeout period set. If images are saved to UpBlink's memory but have not yet been uploaded to CloudX, the number of backlogged photos will be displayed in the UI. When photos have completed the Cloud upload, the blackloged photos will be removed from UpBlink's memory. Clicking the DELETE BACKLOG button will remove all backlogged footage from UpBlink and these photos will not be uploaded. Each UpBlink includes a 2 week free trial period to the CloudX upload service and remains unregistered until the first connection to our CloudX server. Upon the first successful connection to the CloudX server, the UpBlink will become registered to the CloudX account for the email address used in the programming interface. 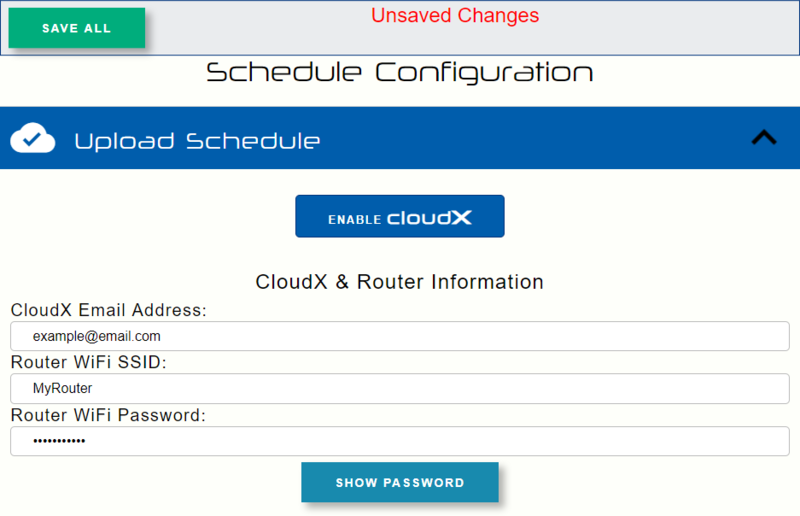 Once UpBlink is registered to your CloudX account and has begun the free trial period, you will then be able to login to your CloudX account at cloudx.cam-do.com to assign any additional subscriptions and manage device settings. Additional subscriptions will be assigned a start date to begin on the day the currently active subscription is set to expire. If the email address used is not yet registered in CloudX, you will be sent a CloudX account activation email. Additional CloudX subscriptions can be purchased from the CamDo website www.cam-do.com by using the same order purchasing email address that is programmed into UpBlink for contacting CloudX. A CloudX subscription period does not activate until it has been manually assigned to a device registered to your CloudX account. Occasionally CamDo will release firmware updates for UpBlink to improve performance as well as unlock additional features. Follow this procedure to ensure UpBlink is updated properly. The currently installed UpBlink firmware version is displayed in the top of the programming User Interface. To ensure you have the most up-to-date firmware, click here. Download the latest UpBlink Firmware File and transfer it to a USB flash drive's root folder. The USB flash drive must be using the FAT32 file saving format (typically the default format for USB drives 32GB or less). Connect the flash drive to the USB of UpBlink. With UpBlink powered from the microUSB power port, hold the WiFi button on the top of the controller. UpBlink will skip the firmware update procedure if it cannot locate the update file on the USB flash drive. UpBlink will not be able to read the file if the USB drive is not using the FAT32 format or the update filename has been changed. The LED remains lit Red when UpBlink has failed the firmware update procedure. The failure indication LED will remain lit until another function triggers the LED. If you have ongoing issues please contact CamDo customer support. Once the LED flashes complete, connect to UpBlink's WiFi and navigate to the UpBlink UI page http://10.0.0.5:5000 to verify the update. Note: The USB flash drive must be using the FAT32 file format to be able to perform the UpBlink firmware update and Blink does not support partitioned drives or other formats. The FAT32 file saving format is the default format for PC and used with most USB flash drives under 32GB. Large capacity flash drives might be using the exFAT format which is not compatible with UpBlink. If you are using a MAC, the following link explains how to format a USB flash drive to FAT32. If the red LED continues to occur during the firmware update process, please contact CamDo customer support. Additional UpBlink Troubleshooting information can be found here. If overlapping schedules have been programmed and there is a conflict between a start time for any action, the priority is given to the lower numbered schedule. For example, schedule 1 has priority over schedule 2. If a schedule is due to be triggered while another schedule is currently performing a task (recording/uploading) the new schedule's trigger will be skipped. What is the UpBlink Event Log? When UpBlink encounters a problem, an entry is saved into the Event Log. You can access the UpBlink's Event Log page when connected to UpBlink's WiFi and using your web browser to navigate to the URL: http://10.0.0.5:5000/log.html or by clicking the Logs Page link at the bottom of the standard UpBlink programming interface.